China is hoping to take things into the realm of ludicrous speed. The Verge reports The China Railway Rolling Stock Corporation (CRRC) is prepared to push the limit of magnetic levitation technology with a train that will attain a speed of 373 mph (600 km/hr). However, there is some conjecture on that point. As TravelPulse’s Patrick Clarke reported back in 2015, Central Japan Railway utilized maglev to see one of its trains reach a speed of 374 mph. But really, we may be splitting hairs in this regard. We presume you would leave any one of these trains with your face permanently stretched and blown back like a cartoon character. The most pertinent part of the report is that technology continues to shrink the amount of time it takes travelers to journey the wide expanse of a country like China. And this is a nation, after all, that is interested in pushing the boundaries of normal conveyances. Just this August, officials test-drove its remarkably unique and slightly crazy straddle bus down the road. CRRC is reportedly in the process of producing a three-mile track for its record-breaking attempt and will also produce more sensible trains that run at a ho-hum 124 miles per hour. 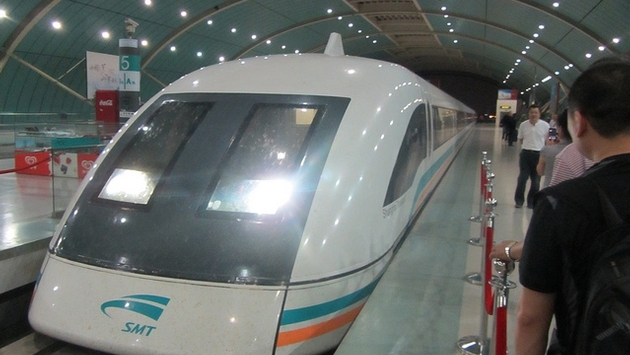 As noted, the Shanghai iteration of the maglev train currently transports human passengers at a whopping 267 mph. This should come as frustrating news to commuters around our beautiful nation continually stuck in freeway gridlock. At least creeping at single-digit speeds lets you catch up on all those great podcasts.